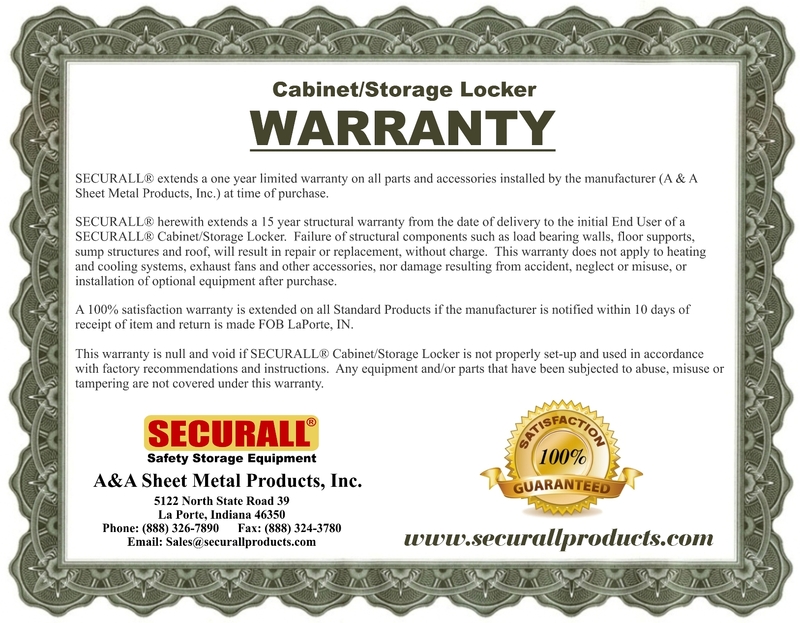 Securall Weatherproof cabinets offer the same dependable storage for flammables and combustibles as our standard safety cabinet line with added protection from the elements. Double-Wall Weatherproof cabinets are all-welded, 18-gauge construction using galvannealed steel and painted with a weather-resistant, impact-resistant urethane finish that is also resistant to ultra-violet rays. All Cabinets STANDARD Features a sloped roof with a 2 3/4" overhang along with interior and exterior astragals to prevent rain penetration. Weatherproof cabinets come standard with corrosion resistant flush-mounted stainless steel locking handle, but may be upgraded to galvanized High Security Hasp Lock. Easily move these cabinets to the appropriate work location using built-in heavy gauge fork lift channels and secure them with fully-welded 7-gauge steel Bolt-Down Brackets with 7/8” diameter opening. Cabinets meet: EPA 40 CFR 264, 265, NFPA Code 30 & OSHA 1910 requirements. S3-05 Addn'l Shelf; Capacity: 500 lbs. per shelf, Approx shelf dim: 27 11/16 W X 26 1/2 D, Approx Ship Wt. 17-lbs. 881-High Security Handle with Hasp; Approx Ship Wt. 5-lbs.